Arizona Republican Gov. Doug Ducey appointed Rep. Martha McSally (R-AZ) to replace Sen. Jon Kyl (R-AZ) as the next U.S. senator on Tuesday. Ducey announced Tuesday that he will replace Sen. Kyl with Rep. McSally. Ducey temporarily appointed Kyl to serve as senator after the death of Sen. John McCain (R-AZ). Kyl will leave his post on December 31. “With her experience and long record of service, Martha is uniquely qualified to step up and fight for Arizona’s interests in the U.S. Senate,” Ducey said in a statement Tuesday. McSally, a former Air Force pilot, lost the U.S. Senate race this November to replace Sen. Jeff Flake (R-AZ), who will retire at the end of this congressional term. Krysten Sinema’s victory over McSally is the first Democrat triumph in the state since 1976. McSally will serve in the U.S. Senate until the next general election in 2020, and the winner of that election will serve the remainder of McCain’s six-year term, which ends after the 2022 election. Gov. 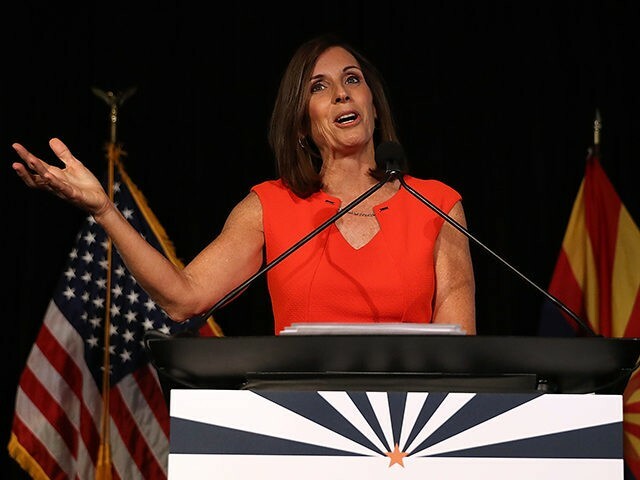 Ducey tweeted Tuesday that, given McSally’s military service and experience in Congress, she is “uniquely” qualified to fight for Arizona in the U.S. Senate. After the election, Kyl said that McSally would serve Arizona well in the U.S. Senate. “I can’t think of anybody more qualified than Martha McSally,” Kyl contended.